* Reply Card Size: --- Please Select --- None - No Reply Card Required A6 - 4.375 in. x 6.5 in. A2 - 4.25 in. x 5.5 in. 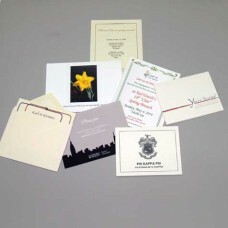 Folded card invitations, envelopes and return cards are available in classic papers, printing in color or black & white. We can print your return address on the outer envelopes and mail merge your address list to print personalized addesses. Be sure to upload your spreadsheet of addresses with your file(s). It's best to send your artwork in PDF format. Check out the File Preparation tips by clicking link on below. Please contact us for pricing on custom projects or if you have any questions.